I am so incredibly proud of this holiday; it has been a dream for several years to be able to pull something like this together which ticks off so many bucket list items for people wanting to see Finland, Sweden and Norway in one holiday and maximise their chances of seeing the Northern Lights. You will travel from unique hotels to wilderness destinations, try a variety of exceptional activities and stay in the cosmopolitan 'Paris of the North' before heading to the fjords for some R&R. This trip covers three countries, all linked in one epic holiday, which still has the Northern Lights at its heart. This really is it, the ultimate Northern Lights grand tour! 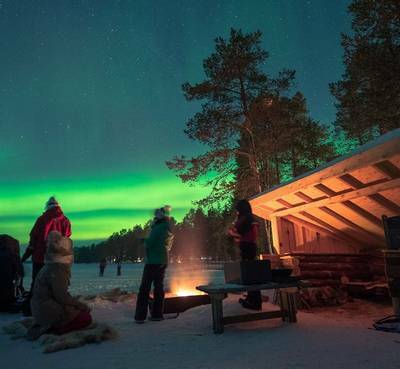 Combining unique highlights of Sweden, Finland and Norway, this 8-night holiday allows you to tick off a huge array of bucket-list experiences. A night at the ICEHOTEL®, dog sledding, snowmobiling, and searching for the Northern Lights in unforgettable locations are just some of the experiences you’ll have. This holiday has so many highlights we basically can't fit them all in the overview! In its simple form, it is a fabulous experience but, we also give you plenty of chances to upgrade to some serious optional extras if you want to really push the boat out. After arrival in Swedish Lapland, this tour starts in the coolest way possible, literally, as you spend the night in the original ICEHOTEL®. There will be plenty of time to explore this world famous hotel including its chapel and icebar before getting tucked up cosy in your Arctic-grade sleeping bag for a unique night's sleep. What a way to start! You can, however, choose to start your holiday the day before, in the south of Lapland, at the exceptional Treehotel, for a night in one of the unforgettable tree-rooms there. The next day you will travel through the wilds of Swedish Lapland and transfer to one of our most popular winter destinations in Finnish Lapland. Here you will meet the hotel's huskies and enjoy a once-in-a-lifetime experience as you travel into the wilderness pulled by a team of eager dogs. Furthermore, you’ll enjoy a thrilling snowmobile safari of approximately 25-30km. Of course, we have thrown in a wonderful Northern Lights activity for you here, as you are at the very heart of the Aurora Zone. After your Finnish adventures, you head even further above the Arctic Circle to the vibrant city of Tromsø, often described as the 'Paris of the North' due to its bustling shops, cafés and truly outstanding restaurants. 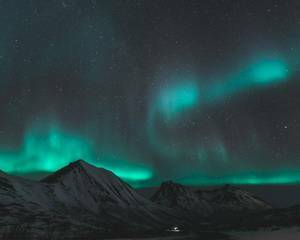 You'll have a night here in order to explore the city but we have included a dedicated Northern Lights hunt here, on your second night in Tromsø, which leads you far from the city lights in search of an Aurora display. 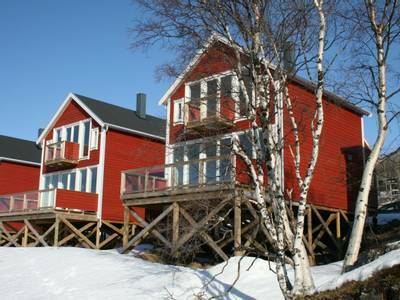 It's then onto the stunning fjord landscape that surrounds Tromsø and you will stay at the marvellous Malangen Brygger, a boutique style fjord-side property with a wonderful atmosphere. 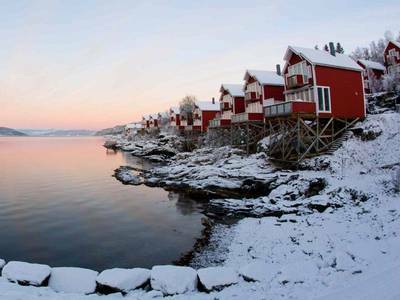 You can spend a couple of days chilling out, enjoying the friendly Norwegian hospitality and doing some final winter activities before transferring back for a final night in Tromsø and to catch your return flights home. Wow – we are jealous just talking about this once-in-a-lifetime trip! 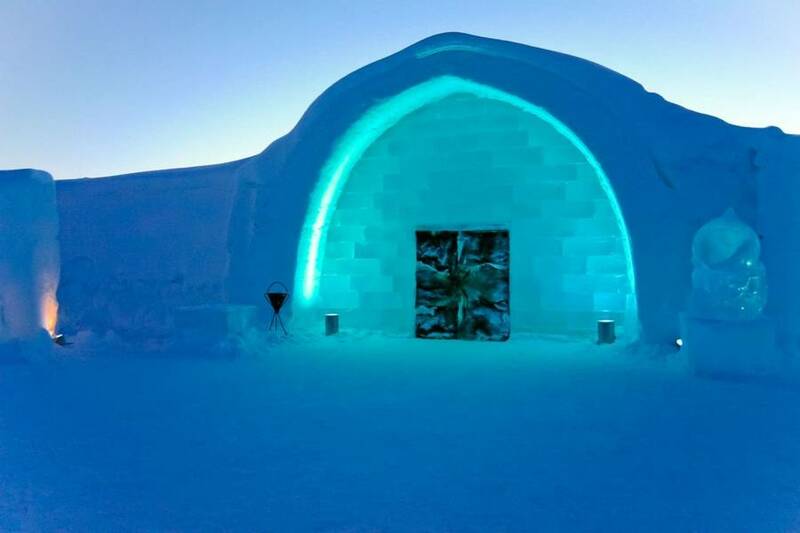 Your adventure begins straight away as you are collected from Kiruna Airport by a representative from the ICEHOTEL® and transferred the short distance to the small village of Jukkasjärvi, home to this world famous hotel. If you want to also enjoy the delights of the spectacular Treehotel then details can be found in the 'Personalise' section of the holiday page. At the ICEHOTEL® there will be plenty of time to explore and take lots of pictures once you have checked in before enjoying an evening meal (bookable and payable locally) and settling in for the night. 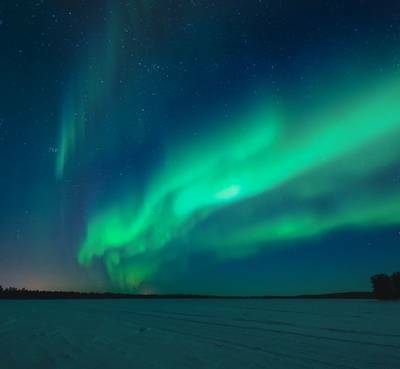 The population of Jukkasjärvi is tiny so there is very minimal light pollution so keep glancing skywards as the Northern Lights may well appear to welcome you to Lapland. You will spend the night in one of the delightful ice rooms at the hotel or we can arrange for you to upgrade to one of the Deluxe or Art Suites if you want to experience the ultimate in ice accommodation (subject to availability). The details of the options can be found in the 'Personalise' section of the holiday page. We highly recommend a warming sauna this morning before enjoying a hot shower and some delicious breakfast - it really sets you up for the day ahead! You will then have some free time to explore the area and take another look around the magnificent ICEHOTEL®. It is now time to wave farewell to Sweden as you are collected for the next section of your grand tour. Your driver will take you through the wilds of Sweden as you cover the distance between Sweden and Muonio in Finland (the drive takes between three and three and a half hours). Upon arrival at Torassieppi, you will check into your room, pick up your cold weather clothing and then it’s straight on to your first activity. You will try your hand at making some Finnish handicrafts. Your guide will show you the techniques that you will need to create some traditional pieces to take home as souvenirs. Following this, your evening meal will be served in the hotel restaurant, then you will be met by an expert local guide in the hotel who will lead you to an optimal Northern Lights viewpoint. 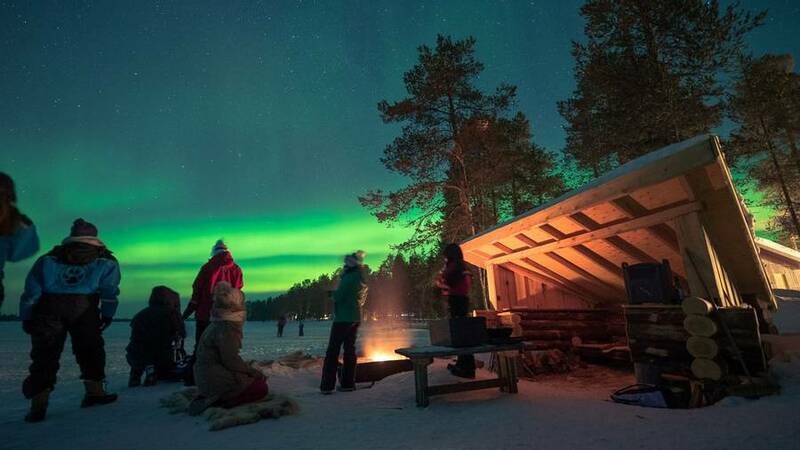 The guide will light a fire which you can gather around to keep warm and toast marshmallows as you await the Aurora. Hopefully, it will put on a dazzling display for you, as your guide answers any questions you have about this natural phenomenon. This morning you will have some free time to spend as you wish. After breakfast, you can take a stroll along the riverbank, or curling up with a good book is also a popular option. If you would like a bit more action in your morning, why not rent some snowshoes or cross-country skis (available for an additional fee) from the hotel reception? 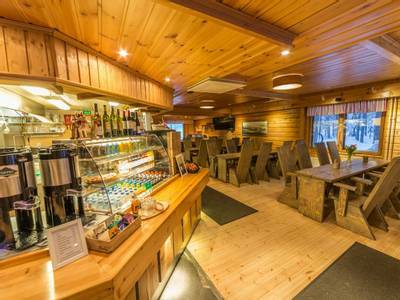 Following a hearty lunch in the hotel restaurant, you will visit the nearby Arctic Sled Dog Centre, home to over 400 dogs who are expertly taken care of and trained by the dedicated staff. You can feel the dogs' excitement as soon as the mushers take the chosen team out of their kennels and begin to get them harnessed up to the sledge ready for your safari. You will be given full instruction and a safety briefing before hitting the trails and will travel two people per sledge, with one person standing on the back driving and the other sitting in the sleigh (there will be the chance for you to swap drivers en route). The safari will last around two and a half hours and led by the guide in front you will explore the picture-perfect Olosvuoma Forest. The trail winds its way between the snow-covered trees and all that you can hear is the sound of the dogs’ paws on snow. Then, it is time for a food-inspired afternoon. You will spend two to three hours cooking several local dishes over an open fire. Then, you will try your mouth-watering creations at dinner this evening. After a free morning to relax after a busy day yesterday, and a delicious lunch in the hotel restaurant, you will take part in a thrilling snowmobile safari, during which you will cover approximately 25-30 km. Following this, you will head back to Torassieppi through snow-clad forests. Two people will share a snowmobile during this activity, which will last for around two hours overall. Your evening meal will be served in the hotel restaurant and following this, you will have a free evening. Why not head outside and await the magical Aurora, hoping that it will make an appearance tonight? Alternatively, if you want to keep busy while you wait, you can book a Northern Lights reindeer safari, detailed in the ‘Personalise’ tab. Our friendly Travel Experts will be more than happy to answer any questions you may have about any additional activities. After a leisurely breakfast, you will check out of your hotel room ready for the next stage in your journey. Today you will be driven from Finnish Lapland to the city of Tromsø in Northern Norway! The journey time is around five hours in total. You will enjoy some stunning scenery as you travel north and the landscape around you will be constantly changing. You will stop in Kilpisjärvi, the northernmost town in Finland and a real outpost, where you can get some lunch (payable locally), before heading over the mountains into Norway and down to the coast. 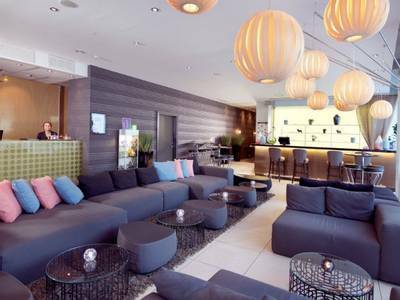 Upon arrival in Tromsø you will have some free time to check into your hotel and enjoy the light evening buffet which is included. We would then suggest heading out to enjoy the sights and sounds of Tromsø, it may be a bit of a shock compared to the wilderness of the last few days, but it is certainly worth exploring. Tonight you may like to add in an additional Northern Lights hunt and we can arrange for you to enjoy a very special Aurora dinner cruise from the harbour. Today you will gain an insight into the traditions and heritage of the Sámi people of Lapland as you visit a local family. This is also a chance for you to encounter the reindeer, whose importance to the Sámi cannot be underestimated. The herds roam freely but there will hopefully be animals for you to greet. Afterwards, you will enjoy a delicious lunch to see you through the rest of your journey. Following on from your visit your journey continues on to Malangen Brygger, your base for the next two nights. You will be able to appreciate the stunning scenery as soon as you arrive at the hotel's wonderful location. After some time to relax and settle into your new surroundings, your evening meal will be served in the hotel restaurant. Following this, your guide will lead you on a Northern Lights chase in the local area to try and see a spectacular show of the Aurora in all of its glory. 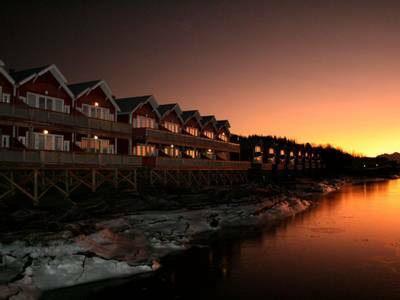 Malangen is a wonderful place to unwind, relax and savour the stunning scenery. Today you can enjoy the local area, or perhaps add in an exciting husky safari – please see our 'Personalise' section for further details. This afternoon relax in the hotel's panoramic sauna, which will be heated for you to truly unwind and enjoy your idyllic and peaceful surroundings. Your evening meal will be served in the hotel restaurant, after which we recommend a short stroll to watch the skies for an Aurora display. This morning is free to relax and enjoy your wonderful surroundings. 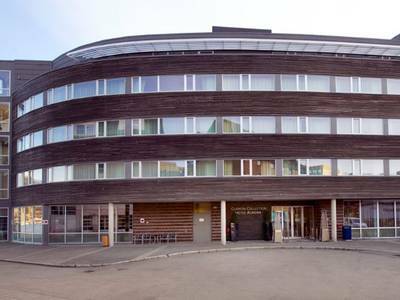 This afternoon, you will catch the transfer back to the same centrally-located hotel in Tromsø for your final night in Scandinavia. After the evening buffet at the hotel, you will meet one of the Northern Lights hunts heading out into the darkness around the city to try and find a clear sky and enjoy one final Aurora viewing opportunity. A taxi transfer to the airport will be arranged to meet your return flight home. If you would like to extend your stay either using the world famous Hurtigruten coastal ferry service or by flying on to a range of other destinations please speak to our Travel Experts for a personalised quotation. We can also arrange for you to extend your time in Tromsø in order to take in more of its rich Arctic heritage. The ICEHOTEL® at Jukkasjärvi has the impressive claim of being the world’s first ice hotel and was developed from a concept beginning in 1989. A local entrepreneur by the name of Yngve Bergqvist who ran a thriving tourism business in the summer decided to attract tourists in the winter by offering ice carving workshops and creating a small ice igloo as a gallery to showcase these designs. What’s more, 2018 saw the ICEHOTEL® become the first ever Nordic Swan Ecolabel hotel made completely of ice and snow. The certification process looks at all areas, from energy and water consumption to waste management; understandably, this presented many challenges when measuring a hotel whose rooms melt away at the end of each winter season! The eco-label adds to a growing list of certifications for the ICEHOTEL® who is also certified a Sustainable Arctic Destination. Certification ensures guests are choosing environmentally conscious products and the ICEHOTEL® are – rightly so - very proud to receive such recognition. The hotel now boasts ICEHOTEL 365, a permanent structure, allowing it to be a year-round destination to visitors who travel the world to sleep in a room of ice and snow. Containing deluxe rooms, art suites, an ice bar and a sculpture hall, this environmentally sustainable building is a construct of glass, metal and concrete, but with the same incredible standard and visual design of snow and ice on the inside, with cooling tubes to keep it at a temperature of around -5 at all times. Alongside this is the classic ICEHOTEL® building, constructed purely of ice and snow and carefully crafted each December, utilising blocks from the nearby Torne River. Home to ice rooms, winter suites and a chapel the structure is a marvel to see and, come summer, simply melts back into the river from which it came. Each year, architects, designers and artists submit designs for the hotel's features and a handful are chosen to go forward with their theme. 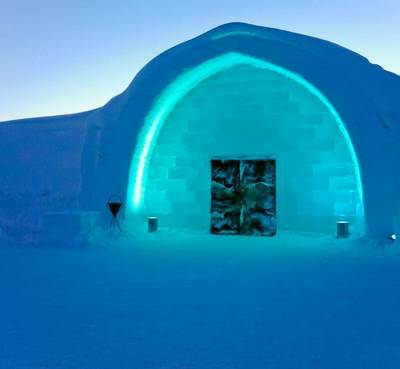 The hotel consists of several buildings including the main ice building and ICEHOTEL 365. We cannot guarantee which area our guests will stay in. The rooms which are contained within the ice and snow building will not be available until after the 14th of December. Check-in time for the cold rooms is usually around 6 pm and for the warm rooms, it is approximately 3 pm. The ICEHOTEL® is open to members of the public for viewing between 10 am and 6 pm. You will check out after breakfast. The Cold Rooms: the inside of the cold rooms is kept at around -5°C but you will be equipped with arctic grade thermal sleeping bags so you will stay surprisingly warm! Please take note that the cold rooms are accommodated in two separate buildings. ICEHOTEL 365 is a permanent building constructed of metal, glass and concrete with an ice and snow interior kept cool via cooling tubes. Some rooms are also in the classic ice building which is made wholly of ice and snow and constructed afresh each winter season. We cannot guarantee which area you will stay in. Ice Rooms (in classic ice building) (only available after 14 December): the ice rooms are the simplest designed rooms which are usually booked as standard. These are made of ice and snow and each contains a mattress topped with reindeer skins and also some ice furniture and carvings. They are closed off from the corridors via thick curtains as opposed to doors, but the thick walls of ice and snow allow for great sound insulation. There are usually around 15 rooms available for guests. Art Suites (in classic ice building) (only available after 14 December): these are uniquely and beautifully designed by chosen artists around the world each year and offer a wide variety of themes and include intricate sculptures and carvings to reflect this. As with the ice rooms, these have curtains instead of doors and there are around 15 in total for guests to book. Deluxe Suites (in permanent ICEHOTEL 365 building): the unique and enchanting Deluxe Suites 365 are individually themed and hand carved by artists commissioned throughout the world, with the designs changing each year. To spend a night amidst the lifelike and exquisite carvings is a surreal and magical experience. You are awoken by sparkling colours which reflect from the ice and cup of hot lingonberry juice at your bedside table. A sauna session then awaits you before you enjoy a delicious breakfast. The Deluxe Suites are part of the new concept ICEHOTEL 365, available all year round thanks to a new specially designed building which is run on solar power. There are three different types of Deluxe suite available. Deluxe Suite Hilla: the Hilla Suites are beautifully decorated suites available throughout the year. They contain a bathroom, two comfortable armchairs, a shower and a sauna, which is directly connected to the bedroom. A comfortable bed decorated with reindeer hides and inclusive of a thermal sleeping bag lies at the centre. The design is a mixture of local culture and history created by Marjolein Vonk and Pia Sandgren. A heated relaxation area is available which provides storage for your belongings and the suite has doors which lock for your privacy. 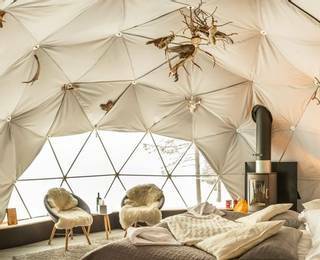 Deluxe Suite Jáuvre: these majestic suites are furnished with comfortable Carpe Diem beds covered in reindeer hides and inclusive of a thermal sleeping bag. Inside the room, there is a bathroom, two comfortable armchairs, a shower, sauna and a bathtub. Similarly, to the other suites, the Jáuvre suites are designed with a combination of local culture and history by Marjolein Vonk and Pia Sandgren and they have a heated relaxation area from where you can store all your belongings and the suite has doors which lock for your privacy. Deluxe Suite Johka: this spacious suite contains a comfortable double bed, a connecting bathroom, two comfortable armchairs and double waterfall showers, which are directly connected to the room. The design features a combination of local culture and history and was created by Marjolein Vonk and Pia Sandgren. A heated relaxation area provides storage for your belongings and the suite has doors which lock for your privacy. Art Suites 365 (in permanent ICEHOTEL 365 building): these offer the same amenities as the art suites in the classic ice building but being part of the permanent building allows them to have a proper door. Each is independently and artistically designed by chosen artists and architects to reflect new carefully chosen themes each year. There are 12 art 365 suites in total. 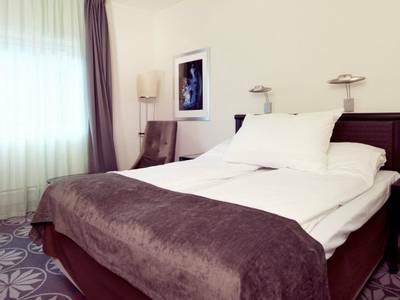 Kaamos Hotel Room (standard): light and airy, these en-suite rooms have modern décor and furnishings. Each has a double bed or twin beds and TV. Kaamos Hotel Room (superior): these rooms have the same amenities as the standard Kaamos rooms, however, they have recently been updated and decorated in a contemporary style. 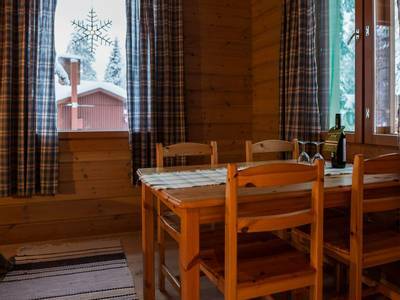 Nordic Hotel Chalet: these are designed to accommodate up to four people. Each has one double/twin bedroom and one room with bunk beds, making them ideal for families or small groups of friends. Each has an ensuite bathroom with shower, small living room with a fridge and kettle and TV. Arctic Chalet: these have a double and a single room so are best suited to three people. 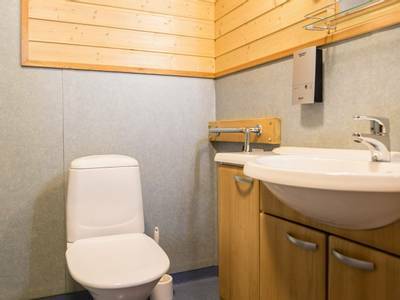 Each chalet is en-suite and has a shower room, small living area, fridge, kettle, TV and telephone. 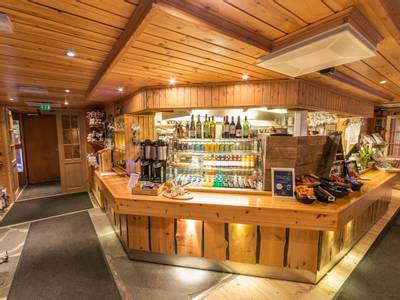 You'll find Malangen Brygger on the banks of the Malangen Fjord around 90 minutes away from Tromsø by car. This is a truly spectacular location with fjord views from all the apartment accommodation. When we say that these apartments are on the water's edge we really mean it; the water laps under their balconies at full tide! Each apartment is individually owned so there's no standardised decor here, just typical Scandinavian design flair. The apartments are all built within a very short walk to the main building where your meals will be served in the excellent restaurant. There's also a couple of rather special features here that you may want to use during your stay; a glass-fronted sauna and an outdoor hot tub both of which have great views of the night sky - the ideal Aurora viewpoint. Malangen is very definitely a place for rest, relaxation and downtime. 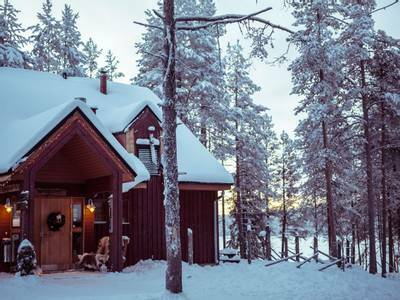 There's wireless internet access but other than that, evening entertainment is about looking for the Northern Lights or simply unwinding with a good book or a sauna....or both. 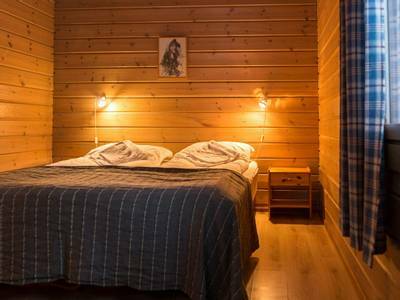 Standard double room: These rooms are all individually decorated featuring photographs of the surrounding nature and scenery captured by a local photographer. All of the rooms have en-suite bathroom facilities. 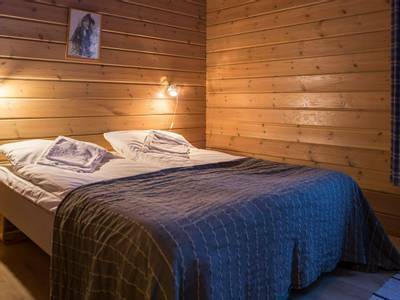 These 18 m² rooms all boast a Hästens double bed and tea and coffee making facilities. Apartment with sea view: The apartments are located a very short walk from the main hotel building right down on the frozen water's edge. The apartments are larger than the other room types at 45 m². The apartment's main attraction is the spectacular panoramic views across the Fjord. There is also a fully fitted kitchen in the apartments however due to the remote location we would recommend stocking up on any supplies either before leaving home or during your time in Tromsø. Torassieppi Winter Village is a marvellous construction of ice and snow, crafted from scratch every winter. During your holiday, we can arrange for you to spend the night in one of the snow rooms here and enjoy this unique accommodation. You will enjoy dinner at your hotel before transferring to check into your snow room (details below). 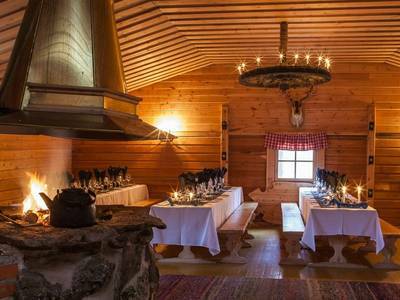 After your stay, you will be served breakfast at Torassieppi Reindeer Farm, before continuing back to your hotel to continue your holiday. If you choose to spend the last night of your holiday at the winter village then you may have some time to explore the delightful surroundings before you head directly to the airport for your return flights home. Torassieppi has ten snow rooms inside large snow igloos. Beds are made of snow and ice, which are covered with a mattress and plenty of reindeer skins (both wonderful natural insulators). You will be kitted out with an Arctic-grade sleeping bag so you should stay warm despite the indoor temperature of around -5°C! NB: Please note that as activity schedules can be subject to change we may be unable to confirm the exact night that you will spend at Torassieppi although every effort will be made to accommodate specific requests they cannot be guaranteed. Your final itinerary including confirmation of the date of your stay at Torassieppi will be confirmed upon arrival in Finland. You’ll be picked up in central Tromsø by your own exclusive Tesla Model X with certified driver and guide. What better way to search for one of nature’s greatest wonders than in a zero-emission, eco-friendly and environmentally clean car equipped with a glass roof. You will be given an introductory talk where you’ll receive your warm suits for the night, followed by a short lesson in Northern Lights forecasting and photography. You’ll then have a brief introduction to our Tesla Model X. 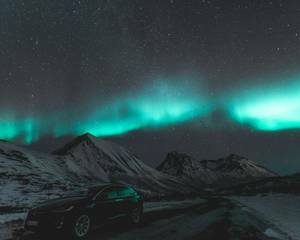 This powerful performance car can cruise the winter conditions with ease, taking you to locations out of the light pollution and on the road to the Northern Lights. Our professional guides know the area well and will explain the science and history behind the Aurora so you get the true insider knowledge. They’ll also help you with your camera settings so you can capture the adventures of the night. You’ll enjoy a meal at one of our favourite local restaurants as well as drinks and snacks throughout the evening. 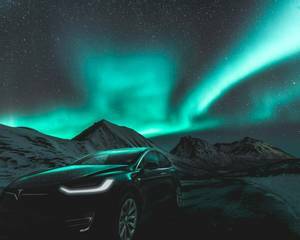 With so many ways to try and see the Aurora in Tromsø, the Tesla tour gives you the option to have a more private and environmentally-friendly experience of the magical display. This sleigh-ride through the ethereal surrounding wintry landscape of Torassieppi is a truly magical and special experience. Your guide will lead you through the silent forests, as you admire the Arctic sky above you. 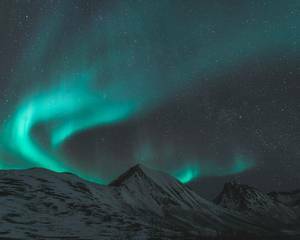 Hopefully, visibility will be good, and you can gaze at the stars and, with any luck, the incredible Northern Lights as they swirl and dance in the sky. As you glide away from the light pollution and into the darkness, your chances will be heightened and, hopefully, this will lead to a successful sighting. If not, you can simply enjoy the relaxing ride, which will last for around two hours. On your first night in Tromsø you can add in this wonderful Northern Lights cruise as you motor out to sea onboard a Catamaran. Throughout you can be outside on the deck or inside watching from the warmth. A hearty traditional meal is included (please note this will typically involve fish) and you can enjoy a relaxing evening onboard as you head out and away from the city lights in search of clear skies and Northern Lights. 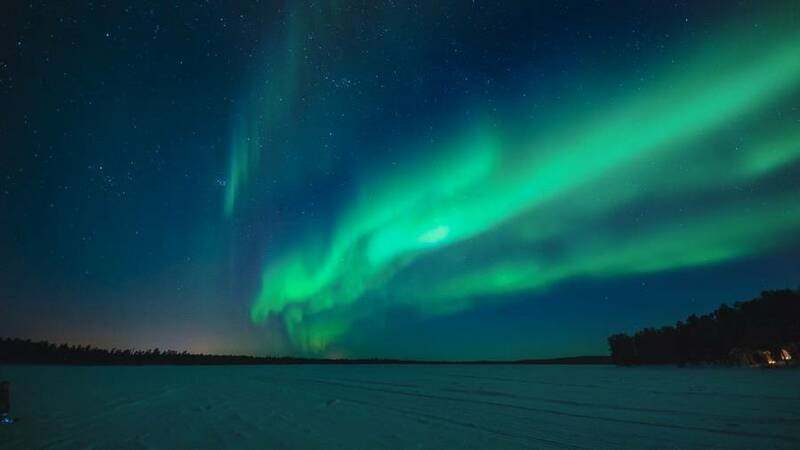 During your unique Aurora hunting experience, you will be provided with warm clothing and hot drinks. 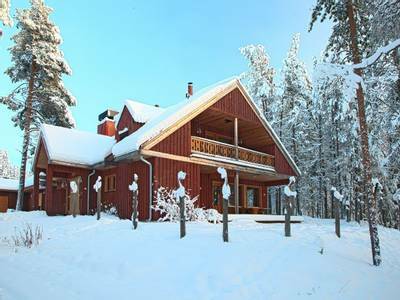 Whilst at Malangen Brygger you do have the chance to enjoy an additional dog sled safari. The safari lasts around three hours and includes a full safety briefing prior to everyone setting off on the trail and driving their own team of dogs. Food and a hot drink will then be served around an open fire for the group to enjoy. 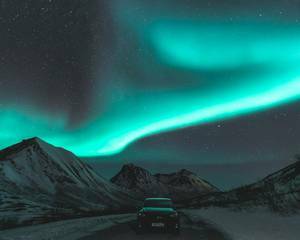 Tromsø is a well-known destination for its Northern Lights viewings and this trip aims to improve your chances all the more by taking your out via bus into the surroundings of Tromsø. Each excursion will have an expert guide on hand on to keep watch and lead you to the most likely destination and the driver will do all they can to hopefully ensure your success. You will be out for around six to seven hours in total depending on the conditions on the night. Hot drinks and biscuits will be provided and clients are advised to warm clothing and a camera and tripod if they wish to. As the drive may take you into the borders of Finland or Sweden, clients are advised to bring their passport also. For a really unique way to start your trip and, to give yourself the opportunity to see a little more of Sweden, it is possible for us to arrange a flight into Luleå Airport and a transfer to the truly unique Treehotel before you head North to Abisko. The hotel offers treetop rooms which have all been designed by award-winning architects. It was the first of its kind and has won endless awards for its innovation. 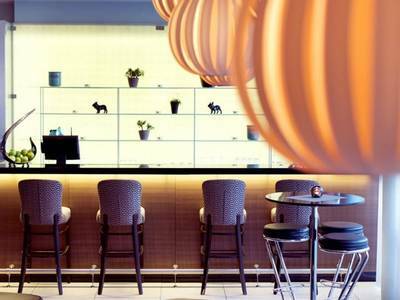 The hotel is has been highly acclaimed by publications such as Vanity Fair, CNN and Elle. You can choose to spend the night suspended in the trees in The UFO, keeping a looking out from The Bird's Nest or watching the world go by from The Mirror Cube - just some of the options. There are only seven rooms here and so all are subject to availability and we recommend booking early to secure your choice. Some of the rooms are not suitable for those without a head for heights so please speak to our Travel Experts for their advice at the time of booking. Dinner will be served in the nearby guesthouse and after breakfast there the next day we transfer you to the train station for the three and a half hour journey north to Kiruna and the next stage of your three-country adventure. The world famous Hurtigruten coastal steamer stops at Tromsø on its routes both north and south and this is a very popular way to end your time in Norway. If you are still looking to discover more of this wonderful country then we can arrange extensions for you to travel north to Kirkenes or south to the Lofoten Islands or Ålesund to name just a few of the options available. We would be more than happy to work with you to personalise any extension you wish utilising this iconic coastal route so simply contact our Travel Experts for details and a full quotation. The holiday was excellent and extremely well organised. I am so impressed by your Company. The transport all turned up when they were supposed to and were friendly and helpful. We enjoyed the husky and reindeer sleding and the snowmobile activities. Actually we just enjoyed it all but the most spectacular part of the holiday was witnessing the aurora almost every night of our stay. Read more great times: so hard to pick a favorite. We also benefited from small groups for each of these activities. Read more two more days of activities and (hopefully!) more viewing, but so far--from dog sledding to snowmobiling to reindeer feeding to sky watching--our Three Countries tour has been sheer delight! Thanks to all of you at The Aurora Zone! !